Freeborn, Jeremy. "Donovan Bailey". The Canadian Encyclopedia, 27 July 2017, Historica Canada. https://www.thecanadianencyclopedia.ca/en/article/donovan-bailey. Accessed 25 April 2019. Canada's Donovan Bailey celebrates the gold medal he won for the men's 100m at the 1996 Atlanta Summer Olympic Games. Bailey defeated the strongest field ever assembled to contest the 100 metres at the Olympic Games (courtesy IOC and CBC). 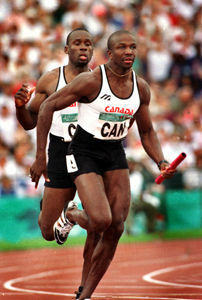 Canada's Donovan Bailey (foreground) and Bruny Surin competing in the men's 4x100m relay at the 1996 Atlanta Summer Olympic Games. 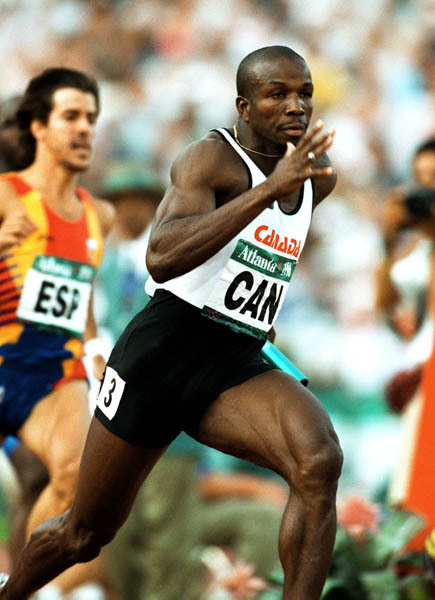 Canada's Donovan Bailey competes in men's 100m event at the 1996 Olympic games in Atlanta. Sprinter Donovan Bailey. He won the 100 metre final with a world-record time of 9.84 seconds against the strongest field ever assembled. Bailey's heroics were the highlight of the 1996 Olympic Games in Atlanta (photo by Paul Chiasson, courtesy CP Archives). 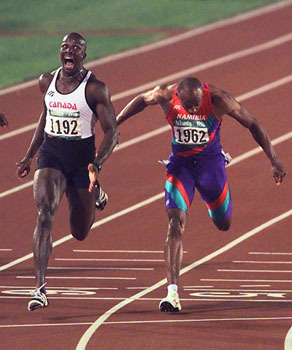 Donovan Bailey taking the men's 4 X 100 to victory at the Atlanta Olympic Games (courtesy Maclean's). Donovan Bailey was born in Manchester Parish, in the mountainous region of Jamaica, the fourth of five sons to George and Daisy Bailey. Before going to Mount Olivet Primary School each morning, Donovan would take care of the family’s pigs, chickens and goats. Donovan visited Canada when he was seven years old and moved to Canada when he was 12. He settled in Oakville, Ontario, with his father and his older brother, O’Neil, and attended Queen Elizabeth Park High School. O’Neil Bailey was an outstanding track and field athlete who won the Ontario Federation of School Athletic Associations Outdoor Provincial Championships four times in boys’ long jump (1980, 1981, 1982 and 1984). O’Neil also excelled in the 100m and football, where he was a star high school halfback. Donovan was also a fast runner in high school, having clocked 10.65 seconds in the men’s 100m at the age of 16. However, his primary passion and focus was basketball. After graduating from high school, Bailey attended Sheridan College in Oakville, and earned a diploma in business administration, with a focus on marketing and economics. During the 1986–87 school year, Bailey played basketball as a forward for the Sheridan Bruins in the Ontario Colleges Athletic Association. After graduating from Sheridan College, Bailey worked as a property and marketing consultant and had a business of importing and exporting clothing. By the age of 22, he owned a house and a Porsche 911 convertible. In 1990, Bailey was watching the Canadian Track & Field Championships when he noticed that some of the competitors were athletes he had beaten in high school. This motivated him to return to competitive sprinting on a part-time basis. In 1991, Bailey won the 60m race at the Ontario indoor championships and was chosen to represent Canada at the 1991 Pan American Games in Havana, Cuba, where he won a silver medal as part of the men’s 4x100m relay. At the 1992 Canadian Track & Field Championships, Bailey finished second in the men’s 100m. The following year, he won bronze in the 100m and silver in the 200m at the national championships. Despite his success at the national level, Bailey did not represent Canada at the 1992 Olympic Games in Barcelona and was only an alternate for the Canadian relay team at the 1993 World Championships in Stuttgart, Germany. Bailey was upset by these decisions and, while in Stuttgart, he complained to anyone who would listen, including Dan Pfaff, who coached Bailey’s high-school friend Glenroy Gilbert. Pfaff, an assistant track coach at Louisiana State University (LSU), told Kenny Moore of Sports Illustrated in 1995, “I’ve never seen anyone run so fast who looked so bad.” He invited Bailey to train with Gilbert at LSU. According to Pfaff, Bailey wasn’t fit and had terrible form. After three months of coaching, weightlifting and sprint training and an improved diet, Bailey was able to cut one-third of a second off his 100m time and ran 10.03 seconds at the Duisburg track meet in Germany in June 1994. In 1994, Bailey represented Canada at two prestigious international multisport events: the Francophone Games in Paris, France, and the Commonwealth Games in Victoria, British Columbia. In Paris, Bailey won the gold medal in the men’s 4x100m relay and the silver medal in the men’s 100m. In Victoria, Bailey was part of the second Canadian team ever to win gold in the men’s 4x100m at the Commonwealth Games, setting a Games record time of 38.39 seconds. On 22 April 1995, Bailey set the Bernie Moore Track Stadium record when he posted a time of 9.99 seconds to win a track meet in Baton Rouge, Louisiana. In the process, Bailey set a Canadian record, 0.03 seconds faster than Bruny Surin’s time of 10.02 seconds, which was set at the 1993 World Championships. Bailey bettered his Canadian record time when he ran 9.91 seconds to win the 1995 Canadian Track & Field Championships in Montréal on 16 July, beating Surin by six one-hundredths of a second. It was the first time that two Canadians ran under 10 seconds in the same men’s 100m event. Heading into the 1995 World Championships in Gothenburg, Sweden, Bailey was a definite contender. His main competitors in the 100m were Bruny Surin, Linford Christie (the reigning Olympic and world champion from Great Britain) and American champion Michael Marsh. Bailey was also the anchor of the Canadian men’s 4x100m relay team (along with Surin, Glenroy Gilbert and Robert Esmie), which posted a winning time of 38.31 seconds. 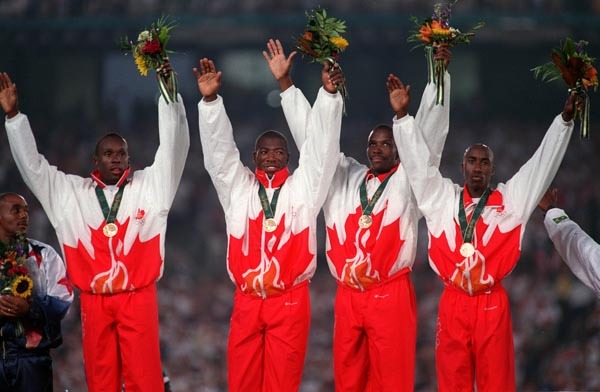 Canada's men's 4x100m relay gold medal winners left to right Bruny Surin, Glenroy Gilbert, Donovan Bailey and Robert Esmie at the 1996 Atlanta Summer Olympic Games. 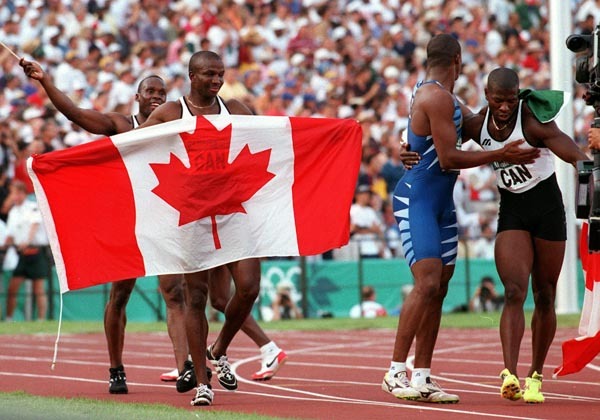 Canada's men's 4x100m relay team left to right Bruny Surin, Donovan Bailey, Robert Esmie and Glenroy Gilbert at the 1996 Atlanta Summer Olympic Games. Bailey had a strong start to the 1996 track and field season, setting the world indoor record (5.56 seconds) in the men’s 50m in February at the Reno Air Games in Nevada. In June, he won the men’s 100m race at the Canadian Olympic trials in Montréal, with a time of 9.98 seconds. In July, he finished second to Frankie Fredericks of Namibia at the Athletissima Grand Prix in Lausanne, Switzerland, where he posted the second-fastest time of his career (9.93 seconds). At the 1996 Olympic Summer Games in Atlanta, Bailey was a strong contender in a very competitive men’s 100m. In addition to Bruny Surin, Michael Marsh and Linford Christie, the field included Fredericks (who had beaten Bailey in Lausanne), Ato Boldon of Trinidad and Tobago (the reigning World Championships bronze medallist), Michael Green of Jamaica (the reigning Commonwealth Games silver medallist) and Dennis Mitchell of the United States (the reigning Goodwill Games champion). Bailey won his opening heat of the Olympic Games on 26 July 1996 but finished second to Christie in his quarter-final heat and second to Fredericks in his semifinal heat. Surin, meanwhile, finished a surprising fifth in his semifinal heat and failed to make the final. In the men’s 100m Olympic final on 27 July 1996, Christie was disqualified for two false starts. With the competition down to seven sprinters, Bailey once again got off to a slower start, but by the middle of the race, he had the most energy and momentum. He caught the halfway leaders, Boldon and Mitchell, and beat Fredericks by five one-hundredths of a second to win Olympic gold. Bailey’s winning time of 9.84 seconds was also a world record at the time. Even though he no longer holds the world record for the men’s 100m, Bailey is currently tied with Surin as the Canadian record holder in distance. 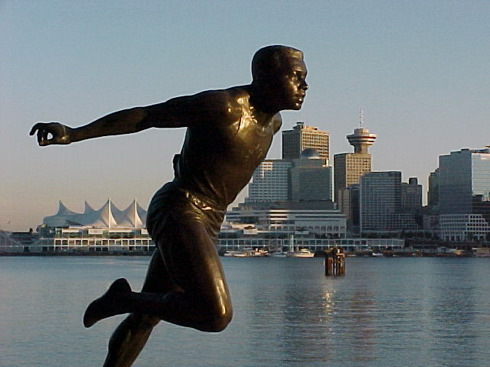 Bailey became the second Canadian to win the Olympic gold medal in the men’s 100m, following Percy Williams of Vancouver, British Columbia, who won gold at the 1928 Olympic Games in Amsterdam. Bailey won a second gold medal in Atlanta in the men’s 4x100m relay. Bailey, Surin, Gilbert and Esmie ran an outstanding final relay on 3 August 1996, defeating the favoured American squad that included two sprinters (Mitchell and Marsh) from the men’s 100m final. 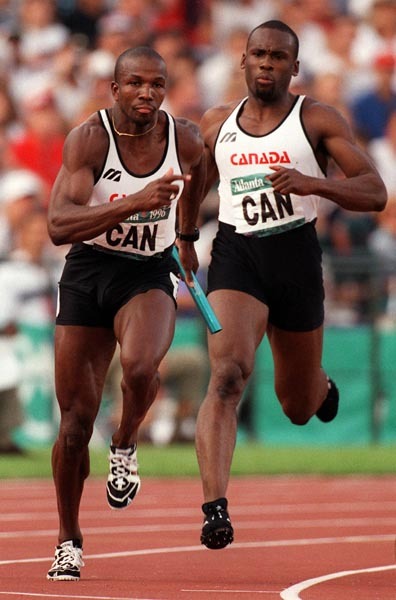 On 1 June 1997, Bailey raced against American sprinter Michael Johnson at SkyDome (now Rogers Centre) in Toronto in an 150m exhibition race to determine the “world’s fastest man.” Johnson had won the gold medal in the men’s 200m and 400m at the 1996 Olympic Games in Atlanta. Bailey posted a winning time of 14.99 seconds, with Johnson pulling up at the 80m mark with a strained quadriceps (thigh) muscle. At the World Championships on 3 August 1997, Bailey won the silver medal with a time of 9.91 seconds, 0.05 seconds slower than American gold medallist Maurice Greene. 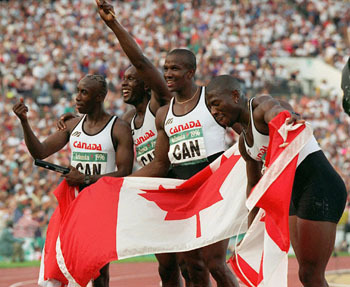 In the men’s 4x100m relay on 10 August 1997, Team Canada defended its World Championships title with a best time of 37.86 seconds. From 1998 to 2001, Bailey continued to race but was plagued by injuries. In August 1998, he finished second (9.93 seconds) behind Bruny Surin at the Canadian Track & Field Championships in Montréal and second (9.96 seconds) behind Ato Boldon at the IAAF Golden League in Monaco.However, in September 1998, he tore his Achilles tendon, which forced him out of action for nine months. In June 2000, he won the Spitzen Leichtathletik Luzern meet in Lucerne, Switzerland, with a time of 9.98 seconds. However, at the 2000 Olympic Summer Games in Sydney, he had pneumonia and did not qualify for the Olympic men’s 100m final. Bailey’s last competition was the 2001 World Championships in Edmonton, where he failed to qualify for the final, owing to a serious knee injury. Bailey has volunteered for Right To Play, the Canadian Cancer Society, the Ontario Lung Association, Big Brothers Big Sisters of Canada, ParticipACTION and Nine Miles of Smiles. 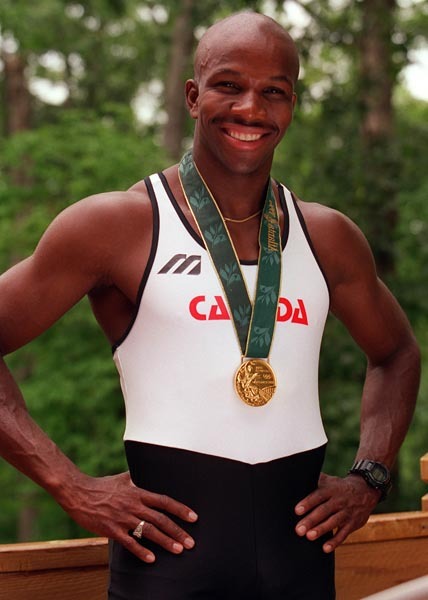 In 2002, he founded the Donovan Bailey Foundation in support of amateur athletes.